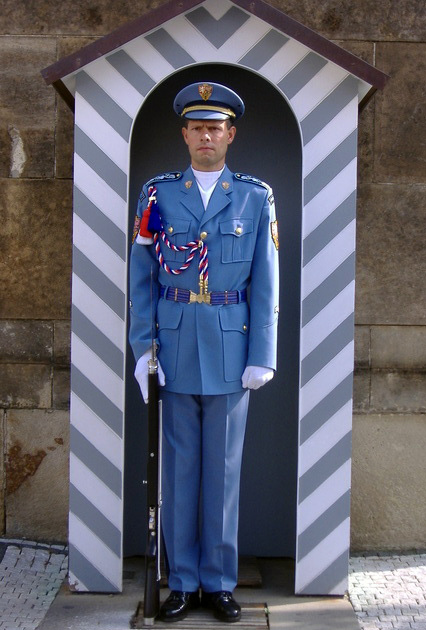 Every hour, on the hour, the Changing of the Guard takes place. 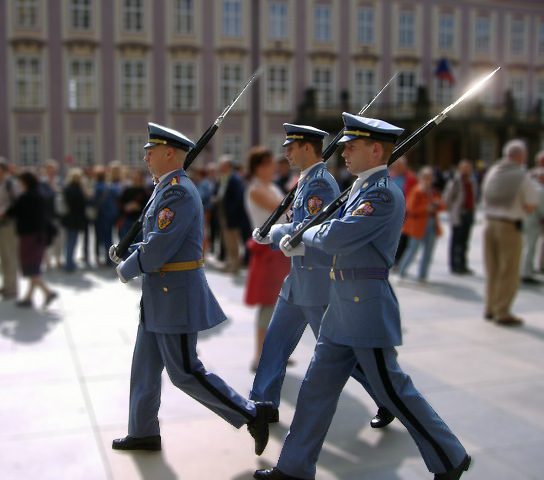 The best time to go is at noon when there’s a ceremonial exchange of flags and a trumpet call, however the real joy of this ceremony is watching the Czech soldiers trying to remember the moves and keep a straight face. Unlike the Beefeaters at Buckingham Palace, with their poker faces and ramrod backs, the Czechs march out of the Royal Palace (in a step that shades a little too closely to the goose step) looking like they’re making a supreme effort not to giggle. Outside the gate they go through the choreographed arms presenting – swinging their rifles around, occasionally heaving them to the wrong shoulder or lifting when they should be dropping. As one guard replaces another in the Guard Box, they take the opportunity to have a whispered conversation when their sergeant isn’t looking. It’s a wonderful, engaging, warm sight – the Czechs being supremely Czech, utterly un-warlike and ready to laugh at anything that takes itself too seriously. Don’t miss it.